Chueak Takrut Tone Kart Aew with Palad Khik Phallic Lingam, and 2 Met Prakam Sek Blessed & Magically Empowered Rosary Beads - a Powerful Talismanic Magic Spell of Protection and Auspicious Fortunes. This Talismanic Wicha composed of 4 Amulets on Blessed waistcord is a multiple Wicha, imbued with a compendium of Magical Powers; Maha Sanaeh, Klaew Klaad, Kong Grapan Chadtri, Maha Lap Metta Maha Niyom, Serm Yos, and Serm Duang. 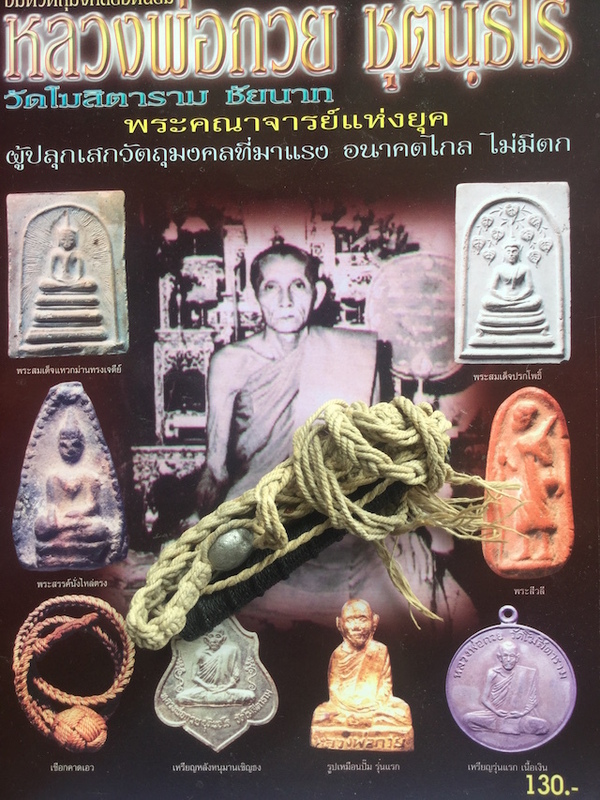 The amulets were created and empowered by the legendary Luang Por Guay, of Wat Kositaram. The Takrut is made from metallic Yantra Foil inscribed with Khom Agkhara spells, and wrapped with black cord for durability, attached to a Chueak Kart Aew waistcord, and has a leaden Look Sakot Bead made from 'Parot' a kind of leaden-silver-mercurial alloy smelted using Alchemy. Also attached is a leaden Palad Khik Phallic Lingam amulet, and a Met Prakam Sek empowered Rosary Bead, with Protecitve Spells and Auspicious Buddhist Blessing, to increase invulnerability, evasion of deadly accidents and to generate prosperity. 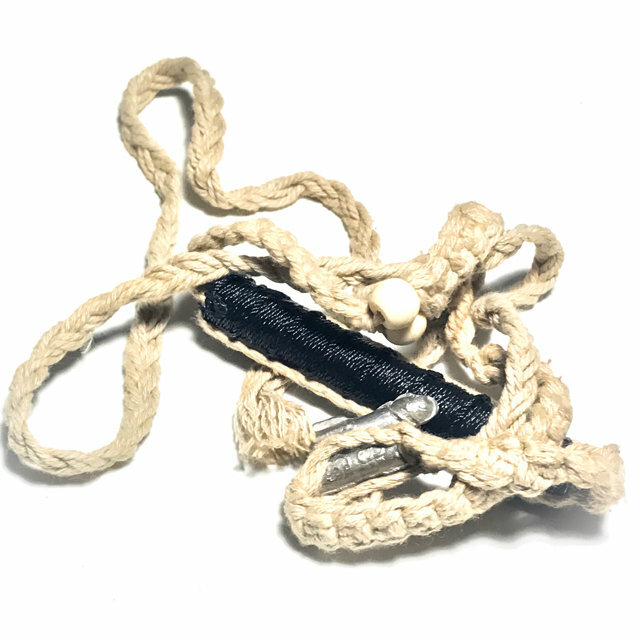 The Talismanic Spell is intended to be worn around the waist like a belt, for all round protection and auspicious blessings. When he grew up a bit, they took him to stay with Luang Phu Khuad at Wat Ban Kae (Wat Kositaram), to receive some schooling. In those days, the area of Ban Kae was still far from infrastructure and Civilization, and too difficult to reach a real school. Luang Phu Khuad asked his Parents beforehand, what Guays birthdate and Birth Year were, as well as questioning them as to his skin complexion, manner of speech. It turned out that the young Guay had the astrological alignments of a ‘Maha Burut’ (Great Person), who would be sure to end up in a high position. Guays skin complexion was lighter than that of his parents, more yellowish and light in complexion, which in Thailand is believed to be the sign of a person with great wisdom and intelligence. He was a child of little speech, but with eyes that reflected daring and penetrating. He was a person with a grand aura of power and strength, but whose manner and movement was gentle and graceful. He learned to read and write and to use mathematics with LP Khuad, and at the young age of six or seven, he was already able to read the Dhammapada and Pali Prayers. So Luang Phu Khuad then continued to teach Luang Por Guay ‘Pasa Khom’ (Ancient Khmer Sanskrit). Luang Phu continued to share as many Wicha as possible with Luang Por Guay. He did this with the knowledge that perhaps one day the young boy might Ordain into the Buddha Sasana as a member of the Sangha, and then these teachings would serve him to be able to become a Great master, in line with his ‘Duang Chadtaa’ (Horoscope reading) which LP Khuad had already examined. 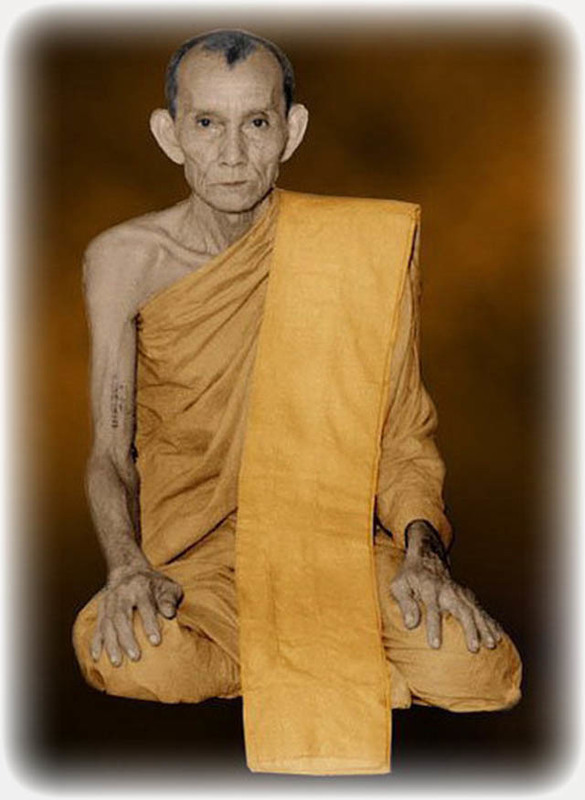 When Luang Phu Khuad passed away, the young Guay was taken from the temple by his parents to continue studying Khom with Luang Por Dam (sometimes spelled ‘Dum’), of Wat Hua Den, which was quite close to Wat Ban Kae (Wat Kositaram). He thus waited until the Moon fell, and it was late. The darkness fell, and he dared to climb up to the window of his loved one with no fear of her Father seeing him. His lover was asleep already, tired of waiting, and the sight he was greeted with made him stand frozen in surprise. She lay with her hair all tangled, and her mouth open in an unmannerly fashion. Spittle was dribbling from the side of her mouth, and she lolled with the covers arranged as the sheets on a corpse. It was not possible to find any beauty there at all in this impression. In this moment, he released his attachments to such matters completely, and fled. He never returned to look for his lover again. Since then, he never had another affair with any lover. This shows that Luang Por Guay was already realized in the renunciation of Sexual Sensory pleasures since before he ordained as a Monk. When he came of age and was sent by his Parents to Ordain, he asked to have a quiet Ceremony at the temple and not to indulge in any of the social celebrations that are traditionally performed and undertaken in Thai Buddhist Culture, which were a simple waste of money in his view, and nothing to do with the Buddha Sasana and the seriosity of the renunciation of a Bhikkhu. He was accustomed to say ‘The Preacher must know the right time to preach, and the Faithful believer must know the limits of his resources’ – this means that the Merit – Maker must donate or arrange for a ceremony that is within their financial limits, and not en-debt themselves just to follow the tradition. The young Guay was brought to his Upachaya Pra Chainat Muni, who shaved his head and Ordained him, along with Luang Por Bpa as the Pra Gammawajarn, and Pra Ajarn Hring as the Anusawanajarn. He was Ordained on the 5th of June 2467 at 15:17 pm. He was aged 20 years old. The Ordination Ceremony was held at the Uposadha shrine room of Wat Po Ngam In Sakburi, Chainat. His Ordained Name was ‘Chudtintaro’, meaning “This world is full of turmoil of the ways of the world, burdened by defilement and desire, which is greed anger and ignorance – He who cuts off the defilement and craving, will reach the far shore of Nibbana”. 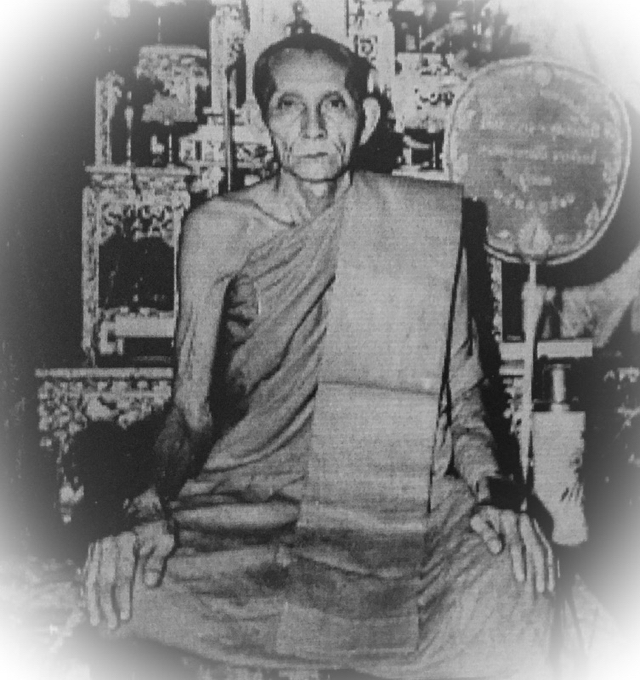 After his Ordination as a Bhikkhu, Luang Por Guay resided at Wat Kae, where Luang Phu Ma was the Abbot at that time. Then he would have been a spinster. He would then preach about spinsters, female and male, and tell how if this person was left by his wife, that he must be intolerable, and if a woman was without husband, its must be because this or that. People who were spinsters or widows would not be able to sit in the Sala and listen, for embarrassment, and would have to go hide behind a wall or a tree to listen to the sermon. It became clear then, that Luang Por Guay did not have the art of preaching very polished. Some people would even break out in tears listening to his sermons about being a lonely spinster. The real reason why he could not give sermons using the Vessantara jataka, was that it is necessary to use quirkiness and humor to tell the tale and make parables. Luang Por Guay did not like to behave in this manner. In order to evade further embarassments, Luang Por evaded preaching by going to learn traditional medicine with Hmor Khian, who was famous for being able to suppress plagues and epidemics. In Koke Chang village many people were dying from an epidemic, and even all the other doctors had died. Only Hmor Khian remained who was able to cure the ‘Roke Khai Torapis’ disease which was quickly killing off all the villagers. 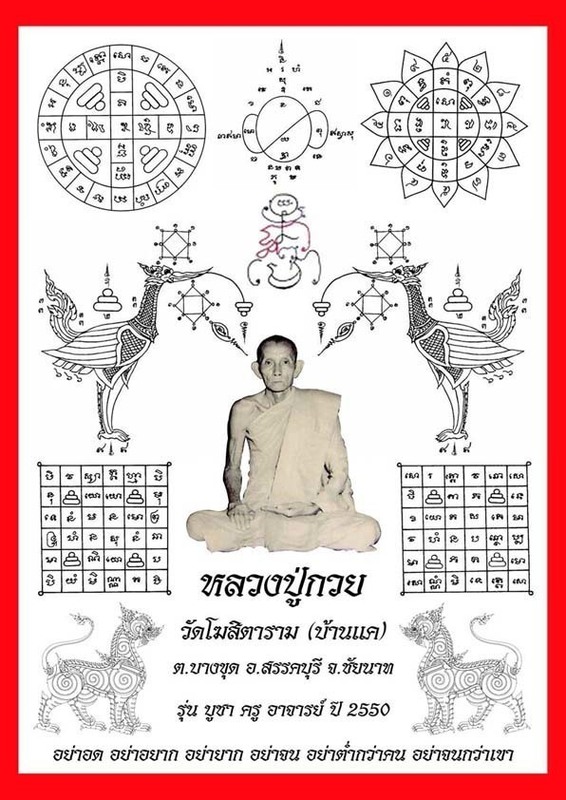 On the 19th May 2472, Pra Guay began to learn Bpariyadtitam (Theoretical Dhamma), in order to develop in his understanding and practice of the Buddha Sasana, studying at Wat Wang Khorn for two years, and then continuing his studies to the Doctorate degree. As he was just about to enter the exams for his qualifications, he became very ill, and was unable to continue. He then decided that he had studied enough, and that he should now focus on Vipassana Kammathana practice and Wicha Akom, and received training in how to make and empower magic charms and amulets, effigies and talismans. He traveled to learn Wicha from Luang Por Sri Wiriya Sopat of Wat Prang (Singhburi), who is said to have been the greatest Vipassana Kammathana Master of the region at that time. It was here that Luang Por learned the Wicha of making magic rings. This is belief is supported by the fact that Luang Por Sri Wiriyas magic rings had the Khom Letters ‘Idti’ inscribed, which are also found to be present on magic rings from Luang Por Guay. Luang por continued to gather Mastery in various other magical Wicha from Luang Por Sri Wiriya. After this, he traveled to stay at Wat Nong Dta Gaew, in Koke Chang, Supannburi. He planted a Samor tree at this temple, which can still be seen standing there where he planted it to this day. Luang Por Saman once went to stay at Wat Nong Dta Gaew, and took a cockerel and placed it in Luang Por Guays tree (chickens sleep in trees). Apparently, the Cockerel refused to sleep all night in this tree. Nobody knows what kind of Wicha Luang Por Guay placed into the tree, but for a Cockerel to refuse to sleep when it is sitting in its most natural sleeping habitat, reveals that there was something unnatural about Luang Por Guays tree. Luang Por Guays powers must have developed rapidly because at the time he planted the tree, he was only 32 years old and had been a Monk for 8 years. This shows that Luang Por Guay had attained Magical abilities at a very young age already. He stayed at Wat Nong Dta Gaew for one year, and then traveled on to Wat Nong Khaem in Sakburi (Chainat Province), where he remained for a period of one year. Whilst he was there, he learned traditional medicine with Yome Buan, a Lay Master from Ban Nong Khaem, and he then continued his studies with Hmor Yai in Ban Bang Nam Pra, close by to Ban Nong Khaem. At Wat Nong Khaem, there was another Bhikkhu befriended with Luanbg Por Guay, by the name of Jaem. One day, Pra Jaem found an ancient ‘Samut Khoi’ (Grimoire in Bai Lan parchment leaf), as he was wandering. But he was not able to bring the book, because it had some kind of protective spell or Deity watching over it. So Pra Jaem invited Luang Por Guay to come and have a look. Whjen they arrived at the tree stump where the book was hidden, Luang Por Guay saw that Pra jaem had told the truth, the Grimoire was indeed there. There were signs of someone having brought flowers, incense and candles to make Bucha with to the Grimoire and placed them beneath the tree stump. So Luang Por Guay lit the candles and the incense, and prayed; “If the Devas who protect this book wish me to take it and preserve the Wicha, then let this incense stick burn out completely”. But the incense stick did not burn completely, so Luang por Guay began again and this time said; “If you let me take the Dtamra with me, I promise I shall only use it for the benefit of the temple and help all Sentient Beings”. This time, all three of the incense sticks burned completely to the ground. Luang Por then performed ‘Gruad Nam’ (the pouring of water to dedicate the fruits of ones merits to the dead – a story covered in Buddha Magic Issue 3), and dedicated the fruits of his merits to the Master of this Dtamra he had discovered, and the Deities who protected it. He then performed the ceremony to invite the Grimoire to come with him to the temple. There was a story circulating after this, that someone once took the Dtamra home with them and put it in their room, but the household experienced much disaster, sickness and even death, so the person had taken it and placed it under the tree stump. When he heard the story, Luang Por Guay opened the book and began to read it, and he found a passage which mentioned that it was forbidden to take into anybodys house at all, if not, there would be great loss and misfortune. Luang Por Guay then began to learn the various Yant and Wicha, memorizing and practicing the magic spells within the ancient Grimoire. This is believed to be substantiated by some tell-tale hints, such as the fact that Luang Por Guay made a Pra Yord Khunpol amulet which had a monk coin from Luang Por Gan inserted in the rear face, which suggests that he may have learnt Wicha from LP Gan and thus used his lockets to inset in his own amulets, as a sign of respect toward and faith in his Kroo. Famous Master Monk, Luang Phu Pimpa, once said of Luang Por Guay that ‘Pra Guay he understands Magic perfectly – before he went to the North to learn their Wicha, he didn’t have any more power than your average monk, but after he returned from learning the Lanna Wicha (referring to his stay in Nakorn Sawan), he kept himself to himself, and spoke little. When he did speak however, it was evident that LP Guays mind was elevated, and that he had a gift of speech’. It is strongly believed that LP Guay really did receive Wicha from LP Derm, because a fotograph of LP Derm with LP Derms handwriting to LP Guay was found in his Kuti. A Looksit of LP Guay remembers also that just after the second world war, LP Guay went to ask LP Derm to teach him the Wicha Tam Tong and the Wicha of Len Prae Taat (minerals and crystals/elements etc), but that at that time, Luang Por Derm did not show him.